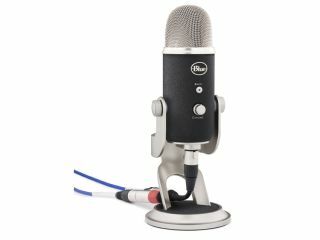 PRESS RELEASE: The Yeti Pro the world's first USB microphone that combines 24 bit/192 kHz digital recording resolution with an analog XLR output. Yeti Pro, the highest resolution USB microphone on the market, offers XLR recording with Blue's custom condenser capsules set in a proprietary triple array, providing the flexibility of four recording patterns (cardioid, omni, stereo, bi-directional) for studio or desktop recording. "We are excited to extend our triple capsule array and four recording patterns from computer-only and into the studio with Yeti Pro," said John Maier, CEO of Blue Microphones. "We recognize the need for truly professional recording quality in a high resolution USB microphone with the versatility to take the mic's distinct recording capabilities into the studio, thanks to its analog output." Like the No.1-selling Yeti, Yeti Pro features Blue's custom condenser capsules in a triple array with four distinct recording patterns (cardioid, omni, stereo, bi-directional). Also like Yeti, Yeti Pro maintains the zero-latency headphone output with volume control for direct monitoring, adjustable microphone gain control and a mute button. Featuring a mic stand thread, Yeti Pro can be mounted on a stand or positioned at the desired angle with the included custom-designed desk stand. Following suit with the rest of Blue's desktop products, Yeti Pro is PC and Mac compatible. Yeti Pro also includes an XLR stereo breakout cable for analog recording. Yeti Pro is designed to provide the highest performance possible in a digital which are limited to fixed resolutions, Yeti Pro employs a next generation A-D converter chip allowing the flexibility to sample at a range of resolutions, from 22kHz up to 192kHz and the common sampling rates in-between. Designed with Blue's professional audio principles, Yeti Pro features separate circuit boards to maintain the integrity of the analog and digital signal paths, and discrete electronic components for the highest signal quality. Yeti Pro, MSRP $249, will be available in January at authorized Blue Microphones dealers.